Renature Monchique is a project to restore land by planting trees in the Monchique area of Algarve, an area devastated by the largest wildfire in Europe in 2018. Ryanair is partnering with Renature Monchique as it works to restore key ecosystems and damaged land thereby returning the potential for this area to deliver ecosystem services once again, supporting local well-being and mitigating against the future impacts of climate change. 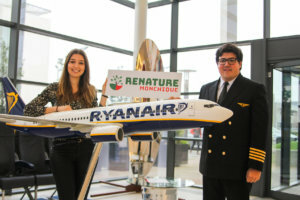 The partnership, launched March 2019 as part of Ryanair’s Carbon Offset initiative will not only offset tonnes of carbon but will also help revitalise the ecology of the Monchique region. This project will support the restoration of important and unique forest habitats to the fire-devastated areas of Monchique in the Algarve. Renature Monchique is an exciting initiative thanks to the partnership of the Portuguese Tourism Board, GEOTA & Ryanair. In August 2018 a Forest Fire devastated the region of Monchique. Thousands and thousands of hectares of trees were destroyed and millions of euros lost as part of the devastation.